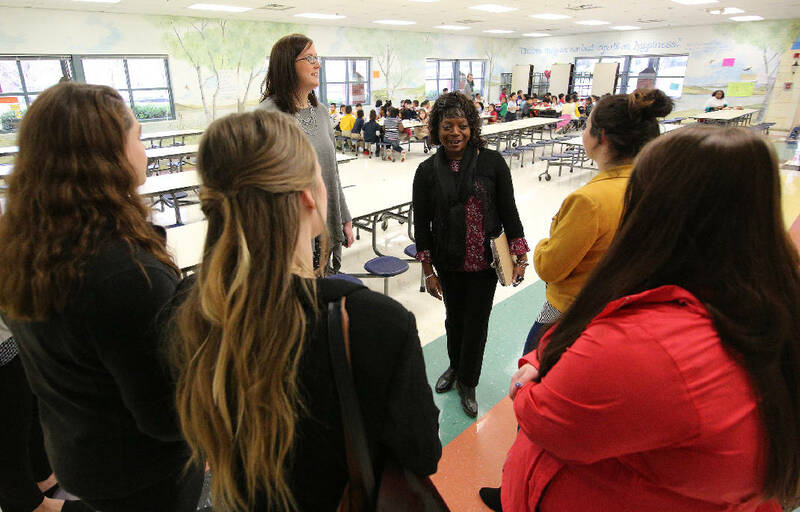 East Lake Elementary School principal Joyce Lancaster speaks to a group of potential teacher candidates at East Lake Elementary School Friday, January 18, 2019 in Chattanooga, Tennessee. Hamilton County Schools is holding school preview, tour days and first-round interviews with interested candidates as the school system prepares for recruiting teachers for the 2019-2020 school year. With recruitment fairs, school preview tours, and early contract offers, Hamilton County Schools is stepping up its recruitment efforts to hire top-notch graduates and recruits for some of the district's hardest-to-fill positions. On Friday, Jan. 18, six prospective teachers toured East Lake Elementary School — one of four stops on their schedule that day — to speak with Principal Joyce Lancaster, meet with the district's recruitment staff and visit classrooms. Most of the candidates are finishing up their last semester at local universities and are hoping to secure a teaching position by the next school year. "It's a really great opportunity to see what our schools are all about," said Jerica Johnson, talent acquisition manager for the district's Opportunity Zone. "A lot of these students said they were interested in learning more about the Opportunity Zone, and this gives them a general idea of what a real school day is like." The district employs more than 3,000 teachers and hires around 300 teachers each year. Internally, current Hamilton County Schools employees have until April 1 to request a transfer to a new school — a deadline that is a month earlier than in 2018 — but most principals already have an idea of where they might have vacancies. The district is already anticipating it will need 35 teachers for fourth and fifth grades, 22 math teachers for grades six to 12, and 22 exceptional education teachers. Other high-need areas include science teachers for subjects such as biology and chemistry, Spanish and English as a second language teachers, speech teachers and school psychologists. "Early hiring — early, early, early — is really one of our key focuses this year," said Keith Fogleman, chief talent officer for the district, at a school board meeting Thursday. Only 53 percent of the district's new hires were made by May 1 in 2018, but high-performing districts aim for 65 to 70 percent. Last fall, the district partnered with TNTP, formerly known as The New Teacher Project, a national organization that supports efforts to recruit and maintain quality teachers, to review its recruitment, support and retention process. The organization's consultants came back with several recommendations for the district, including improving the prospective candidates' experience throughout the hiring process, aligning technology with recruitment strategies and strengthening relationships with local organizations and universities to help find talent. Through these recommendations, the school preview days, efforts to hire teachers early into pools and other initiatives were born. "We are already working with a lot of our university and community partners, but we really need to formalize those relationships and establish a talent task force," Fogleman said. "We also need to have an increased focus on customer experience." Friday's school preview day focused on the Opportunity Zone and took prospective teachers for tours of six schools — East Lake Elementary, Dalewood Middle, The Howard School, Orchard Knob Elementary, Orchard Knob Middle and Woodmore Elementary. "These visits give prospective candidates the opportunity to ask questions and see what's going on in our tours," said Penny Murray, director of human resources. After the school tours, the prospective teachers also had the opportunity to have formal interviews with a panel of principals and content coaches with the possibility of being offered a position. Megan Wimpelberg is a senior at Lee University and a student teacher at Arnold Memorial Elementary School in Cleveland. She had heard about the Opportunity Zone and has her heart set on getting a job in Hamilton County. "I've always wanted to be a third or fourth grade teacher. Those are the grades I remember the most," she said. Wimpelberg first learned about opportunities in Hamilton County during a recruitment presentation at Lee. "The first thing that caught my eyes is that they say 'Engage your students every day,'" she said. "And how much they care for you as a teacher so you can care for your students." Though others have told her that the Opportunity Zone, which includes the district's 12 highest-needs schools and has high rates of teacher turnover, can be a difficult place to work, Wimpelberg said she's up for the challenge. "Everyone knows the first year teaching is going to be difficult," she said. "I wouldn't have encountered education if I didn't want a challenge." These highly motivated, top graduates with a heart for some of the district's hardest schools to staff are exactly the type of candidates district officials hope to find and hire before they even graduate. Fogleman's team is also looking at how to expand signing bonuses for certain schools and subject areas, create teacher referral incentives and explore offering relocation incentives. He acknowledged that though Hamilton County Schools has a good benefits package and is improving its recruitment process, it still has room to improve to be competitive with other large school districts in the state. "Some of the signing bonuses that we are currently doing are reasonably competitive, but there are other school districts telling us that we have some opportunities in relocation assistance and the area of a teacher referral program to improve," he said. "While I think we've made some progress, there is some progress to be made." The team will invite more prospective hires to four more school preview days this spring that will include schools from all areas of the county. Erin Harrell, also a talent acquisition manager for the district, said the idea for such preview days came from experiences she and Johnson had as college recruitment coordinators. The recruitment team expanded its university schedule from 15 campuses to 36 this year. "It's a great recruitment tool for us. We want them to be able to find a school that is a good fit for them," Harrell said. "Our goal is recruitment fairs, school tour days and other interactions hopefully lead to many early offers." Harrell did acknowledge that ideally many principals hire experienced teachers, who historically receive offers earlier in school hiring season. In large districts, there will always be spots to fill with new talent, though. The district has also rolled out extensive new teacher support programs this year, including a three-year induction program, new teacher support coaches, a new teacher network, and matched every new teacher with a mentor teacher. These initiatives are an effort to improve the district's first-year retention rate, which hovered around 74 percent at the end of the 2017-18 school year. "We are trying to work on retention, especially in the Opportunity Zone," Harrell said. "Obviously we want teachers to be at a school that is a good fit." While Friday's prospective candidates relaxed and networked at lunch between school tours, The Howard School's Principal LeAndrea Ware stopped in to thank them for their interest — not just in working in the Opportunity Zone, but in the teaching profession as a whole. "Thank you so much for even choosing this career, is it not the best career ever?" Ware said. "I've been doing this going into my 24th year and I'll tell you, it's the most amazing experience I've had in my life. I don't regret, not one day of it. You could not have made a better choice than to go into education."